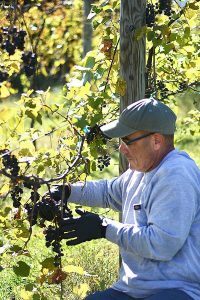 Estate vineyards like Northern Cross in Easton, NY rely on neighboring growers, friends and family to help harvest the season’s crops. With nearly two acres planted, Northern Cross Vineyard, owned by Andrew and Kathleen Weber, is large enough to produce the volume of grapes needed to make wine, but small enough that mechanized harvest isn’t viable. “It’s therapeutic and relaxing to be out here. It’s not hard work and there’s no bending over,” said Kelly Michel, a harvest volunteer who lives nearby. “It’s a great way to help out, spend time together as a family and enjoy the outdoors,” added Julien Wertz. He and his family recently moved to the United States from France. Neighboring grape growers lend a helping hand in a model that’s a throwback to how farming was done nearly 100 years ago. “We come and help each other because this is an up-and-coming wine region and when you’re not in a wine region like Napa Valley, you have to work with your neighbors to make good products,” said Tom Pellegrino, the owner of Pellegrino Vineyards in nearby Cambridge, NY. Vacations to Spain planted a seed of interest. “Every time we were in Spain, we’d say, we wished we lived here so we could have a vineyard,” Kathleen said. The Mediterranean climate is ideal for growing grapes and the Webers knew their land in Washington County was subject to harsher winters and subzero temperatures, which they knew most wine grapes won’t tolerate. A trip to Lincoln Peak Vineyard in New Haven, VT introduced the couple to northern climate grapes, a variety that could not only survive; they thrive despite cold winters. For nearly two decades, researchers at the University of Minnesota had been cross-pollinating grape varieties to create a northern climate grape. The specially bred grapes are designed to withstand temperatures as low as -30° F and produce fruit that can be used alone or in combination to make great tasting wines. Prior to the development of these grapes, growers in New England and the Upper Midwest were limited to a few varieties such as the Concord grape. Even those grapes didn’t always have time to ripen in the regions’ short growing season. In 2011, Andrew and Kathleen planted their first vines. Today, their vineyard spreads across four acres and includes five varieties: Marquette, Frontenac and St. Croix for red and Lacrosse, La Crescent and Prairie Star for white. “We’ll tell customers that they may not have heard these names before, but we are sure that our wines will offer them a fresh tasting adventure,” Kathleen said. The tasting room, in a renovated 19th century barn, is open to the public on weekends. The cozy space provides guests an opportunity to choose their own experience from tasting to touring and picnicking, enjoying the free Wi-Fi or simply hitting the pause button. “We offer a relaxed, seated tasting experience, and encourage guests to take their time,” she said, “we love to share our insight and knowledge about making wine. The name, Northern Cross, was in part inspired by the vineyard’s location on the north-facing slope of a rolling hill in New York’s “north country”. “The name is also fitting because we use northern climate grapes,” said Kathleen. This is important because it differentiates wineries that make wine from local grapes within the AVA from wineries that buy grapes in bulk from non-local sources outside the AVA. For example, growers in western New York can label their wine as Finger Lakes wines. Those in Napa Valley, California, can associate with the prestige of the region. Wine drinkers within the AVA will know that if doesn’t have ‘Upper Hudson’ on the label, it’s not local wine. In 2015, Andrew and Kathleen submitted a perfected petition to the Alcohol and Tobacco Tax and Trade Bureau (TTB), United States Department of the Treasury. Once approved, the Upper Hudson AVA will encompass producers in Albany, Montgomery, Rensselaer, Saratoga, Schenectady, Schoharie and Washington counties. Currently, the AVAs in New York include Cayuga Lake, Champlain Valley of New York, Finger Lakes, Hudson River Region, Long Island, Niagara Escarpment, North Fork of Long Island, Seneca Lake and The Hamptons, Long Island. Once approved, the Upper Hudson will become the 10th AVA in New York. The couple anticipates the designation will be made official in 2017. The Webers are hopeful that obtaining a designation for the region will encourage others in the area to open a winery, which will in turn attract tourists who want to experience grape to glass. To learn more about Northern Cross Vineyard visit www.northerncrossvineyard.com . Getting Wasted: A Fruitful Proposition?